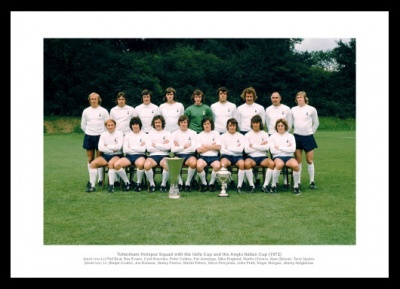 Some of Spurs' legends of the 70s are featured in this historic squad photo from 1972 with the Uefa Cup and the Anglo Italian League Cup Winners Cup. (back row,l-r) Phil Beal, Ray Evans, Cyril Knowles, Peter Collins, Pat Jennings, Mike England, Martin Chivers, Alan Gilzean, Terry Naylor. (front row, l-r: )Ralph Coates, Joe Kinnear, Jimmy Pearce, Martin Peters, Steve Perryman, John Pratt, Roger Morgan, Jimmy Neighbour.